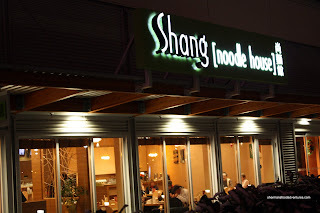 As mentioned by Jenny and Wendy there are a number of set meals which include noodles, appy and a drink for $9.50. Viv decided on Special B which included the Spicy Beef Ramen with a side of pan-fried Radish Cake and Passion Fruit juice. All I can say is that the ramen was "interesting". Not like any ramen you'd find at Kintaro or Benkei, it was more like Chinese noodles in a spicy broth. There was plenty of beef and overall, it wasn't horrible. I'm sure they are using the Japanese word "ramen" in place of "lai mein". 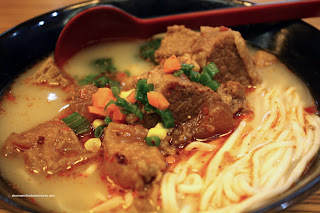 It's been argued that the origins of ramen come for the Chinese lai mein. 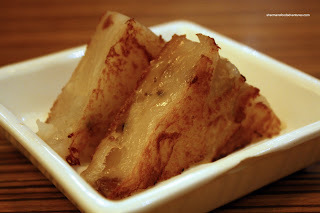 The radish cake was alright. It really needed a bit more frying. For the kiddies, I got them a Japanese BBQ Pork Udon in a miso broth. 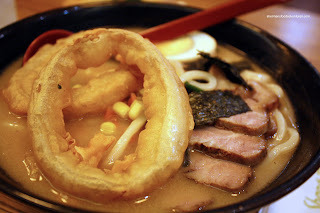 I already knew about the onion rings from Jenny's post, so I wasn't exactly shocked when the bowl of udon arrived. However, who puts a crunchy onion ring in soup? Soggy, disgusting and inedible, the onion ring should be served on the side or not in it at all. Furthermore, the boiled egg was so overcooked, it exhibited more dark rings than a dirty toilet. But I did like the pork, it was tender and had good flavour. The miso broth was decent as well. With a few tweaks, this bowl of udon would've been alright. For myself, I went for something that wasn't soup based - the Stir-Fried Shanghainese "Ramen" with pork and mushrooms. Rather than using the traditional thick Shanghainese noodles, they used the thin variety and that suited me fine. 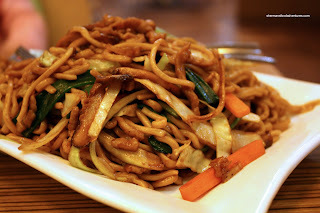 When I make this dish at home, I much prefer the thin noodles, it's easier to eat. I am happy to report that this dish was a winner. It had good colour, "wok hay" and flavour. The noodles were soft while still being chewy and the veggies were crisp. We also had an order of Spring Rolls and they were awful. One bite and there was oil dripping everywhere. These were fried at the wrong temperature because they were completely oil-logged. Frankly, it was really gross. You know what, I'm not exactly sure what I can say about this place. It was alright with some decent points combined with some pretty low points. Value-wise, it was not bad considering the decor, cleanliness and quantity of food. However, it's not someplace I'm aching to make a return visit. Admit it. You went for the restaurant and not for Walmart! LOL. thanks for the shout out, I really liked the look for this place, and their food is not bad.